-- TWO base cards or parallels with 85 veteran & legend base cards numbered to their jersey number, giving set collectors a unique challenge. Whenever some collectors break open a box or pack and gets a memorabilia card, thoughts often race toward the story behind the swatch that sits in their hands. Sometimes, it is easy to discover that it was simply worn by the player in a photo shoot. The description could simply say that it was worn in a game. With 2017-18 SP Game Used Hockey, many of the cards are tied to actual NHL events. This gives a certain satisfaction of knowing the origin of the material embedded within. That is not to say that this edition of one of Upper Deck’s longest-running brands only offers up memorabilia cards when it is released January 17th. In fact, there is plenty to discover inside from extremely limited base cards and Rookie Cards along with lots of ink and parallels. 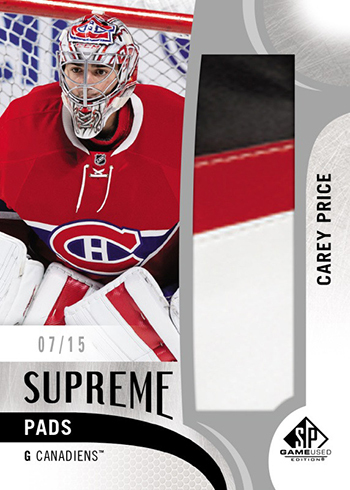 2017-18 SP Game Used Hockey delivers one of the most limited base sets of the season. Each veteran or legend base card is serial-numbered to the digits on the player’s jersey, which makes for some tough pulls. For example, Connor McDavid’s base card will be much easier to get than Patrik Laine since McDavid wears number 97 while Laine has 29 on the back of his sweater. The base set has 85 veterans and retired players plus 100 Authentic Rookies. When it comes to parallels, 2017-18 SP Game Used Hockey has a lot to track down. In fact, it will be easier to get parallels than the regular base cards in many cases. Some of the base cards and Authentic Rookies have an autographed variations. This is basically part of the regular print run with the last card for many players being signed. This means that the 34th card for Auston Matthews is signed or the 8th for Alex Ovechkin. However, many cards also have a more plentiful Blue Autograph parallel (1:8 for Authentic Rookies, 1:10 for Base). The basic parallel rainbow for base cards begins with Orange Rainbow (varied numbering), and continues with Green Snow Storm (one-of-one). For Authentic Rookies, there are both Rainbow (/200 plus age) and Orange Rainbow (/100 plus draft year) along with the Green Snow Storm cards. Several memorabilia parallels are also available for most cards. Vets and legends have Gold Jerseys (1:4) that have a patch parallel (varied numbering). These go along with Red Autograph Jerseys (1:20) and Spectrum Autograph Patch (varied numbering). The Authentic Rookies have a similar setup, but different odds or production numbers for Gold Jersey (/399), Gold Spectrum Patch (/49), and Red Autograph Jersey (1:15). They also have Red Spectrum Autograph Patch (/15) versions. Since it first arrived on the scene back in 2000-01, SP Game Used has managed to remain true to its intention to deliver big memorabilia hits and this edition aims to carry on that tradition. The memorabilia and autograph hits scheduled for 2017-18 SP Game Used Hockey start with Banner Year, which takes pieces of the banners seen at various NHL events and puts them inside a card. Events slated for inclusion this season are the 2017 NHL All-Star Game (1:10), 2017 NHL Winter Classic (1:18), 2017 Stanley Cup Final (1:14), NHL Draft (1:9), 2017 NHL Stadium Series (1:18), and NHL Centennial Classic (1:14). Autograph parallels are also be available for all of these sets. Some of those events also help make up some of the core memorabilia collections in this release. 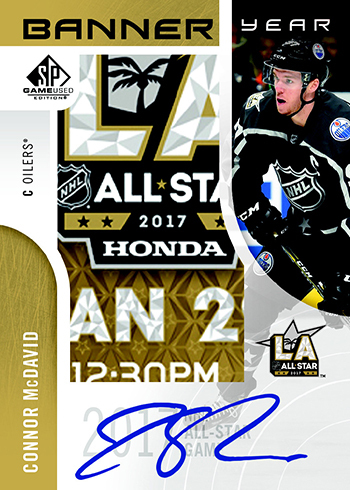 2017 NHL All-Star Skills Fabrics (1:3) have Patches (/35), Duals (1:20), Dual Patches (/25), Quads (1:120), and Quad Patches (/10) to chase down. 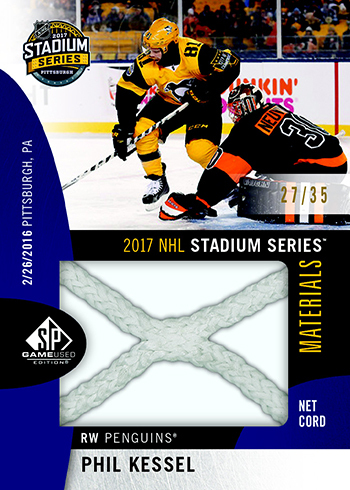 Both the Stadium Series and Centennial Classics memorabilia cards come at a 1:10 rate and their parallels are inserted at similar ratios as well (/35 Patch, 1:120 Quads, /10 Quad Patch). Puck pieces are long-odds pulls in 2017-18 SP Game Used Hockey. These pieces are taken from the Stadium Series, Winter Classic, Heritage Classic, Stanley Cup Final, and All-Star Game. Each type is seeded at a 1:720 rate. A Goal Pucks collection (1:240) is also available. 35), Heritage Classic (/35), Stadium Series (/35), All-Star Game (/35), and Stanley Cup Final (/25). All have a one-of-one Shield Logo parallel. 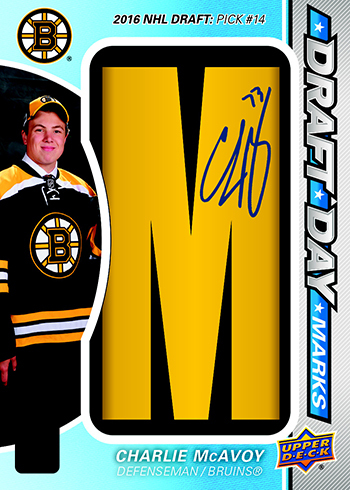 Draft Day Marks have been a popular feature in SP Game Used for quite a while. This season, both Rookies (/35 per letter) and Veterans (/10 per letter) are joined by 500 Goal Club Marks (/25). 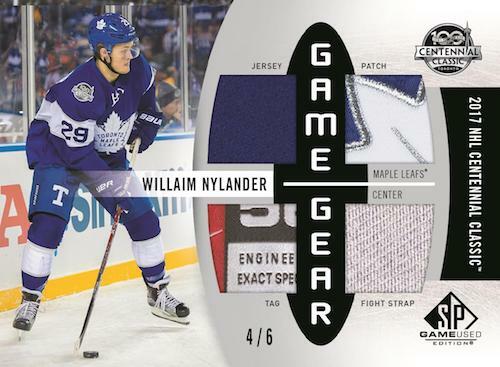 Game Gear (/6) is back and looks back on the NHL All-Star Skills event, Stadium Series, and Centennial Classic. Inked Sweaters return as well and are limited to varying quantities much like its patch parallel. 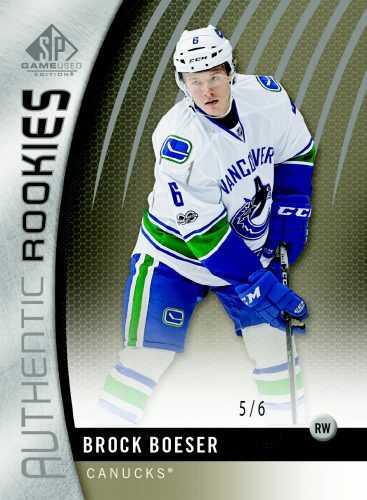 Rookie Sweaters (/199) also have an Inked Patch edition that is limited to a very reasonable 49 copies. Frameworks (1:12) are back for a second straight year, too.